Editor’s note: We’ve been informed that the route described below, through La Garita Wilderness, is not permitted for mountain bikes. Instead, a four-wheel-drive road that traverses from the trailhead to within a half-mile of Wheeler Geologic Area is the proper route for mountain bikes. We apologize for the misunderstanding. 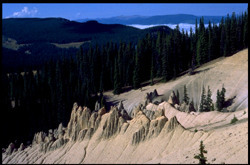 Geologic time in the Rocky Mountains is frozen time. The most striking formations tucked into the high valleys of the West are often the result of cataclysmic events, such as ancient volcanic explosions. They later became woven into the mythos of those ancient ones who stumbled upon them. To step into these magical places today is like holding back the fabric of time itself, and stepping into an primordial realm of wonder. “City of Gnomes” is what some called this area northeast of Creede, Colo. Today we call it a much less imaginative name — Wheeler Geologic Area. Luckily, this land is well off the beaten path — far from interstate highways — so few know of this untouched area. The reward for those who venture here is a glimpse into a haunting, mesmerizing world of rock and erosion, a cosmic temple in which shutterbug “gnomes” today bow in fascination. One can only imagine how the Colorado Ute Indians spent time here — perhaps summoning the grand forces of earth and sky into a primeval symphony. Nestled in south-central Colorado, Wheeler Geologic Area is accessed two ways — by a 11-mile, winding jeep road, or an 8-mile hiking trail. Fortunately, most visitors we encountered either hiked or biked in. Somehow, Wheeler is too ancient, too sacred a place for motorized vehicles. The mild rigors of walking or biking to Wheeler are more than compensated by the visual feast that awaits at the end of the trail. Since Wheeler is worth at least a day of exploration, visitors should consider camping out at one of the several campsites about one-half mile from the formations. Cycling in takes about 2.5 hours, depending on the weather and one’s level of condition. Because of the high-altitude of this trek, beginning at 10,800 feet and rising to 11,800, weather may become severe quickly as storm cells find their way into this maze of valley, meadow and peak. With our mountain bikes equipped with panniers, we departed Hanson’s Mill (17 miles from Creede via Colo. 149 and U.S. Forest Service Road 600) on East Bellows Trail. The trail begins by darting through Engelmann spruce forest at a relatively even grade, then quickly descends to East Bellows Creek, which during the spring can be running high. From this point, the trail steadily ascends for about 4 miles. The single track is often rocky, requiring a steady and sure navigator. Slicing through a narrow little canyon, Canon Nieve, the trail climbs to Silver Park, a sprawling high-altitude meadow sprinkled with glacial rocks. After winding its way to a lonely crest, the trail meets up with the 4WD road and descends to the campground. Wheeler Geologic Area is a little more than one-half mile from the campsites, and mountain bikes are not permitted past this point. Wheeler sits in a remote area that must have been passed by many times before it was discovered. Because of this, it is said that Ute renegades often used the City of Gnomes as a hideout. Nothing quite prepares you for the first glimpse of Wheeler. These “Phantom Ships” are, in the perspective of geologic time, still moving, eroding over the centuries. They first set sail when fiery volcanoes in the San Juan Mountains detonated, depositing the ash, or “tuff” here. In the eons of time since, wind and rain have sculpted a huge flotilla of pinnacles, spires and phantoms. The crumbly, silent statues allow visitors to scramble around, and the dozens of perspectives provide an endless variety of geologic tableaus. A trail, a little more than 2 miles long, circles Wheeler, and a spur continues on to Half-Moon Pass and the remote La Garita Mountains beyond. Leaving Wheeler is like placing a bookmark in Geology’s Guest Book. Yes, we’ll be back, perhaps under a full moon, when we’ll stowaway on a phantom ship and sail to eternity. Actually, you can ride bikes to the parking area, where 4WDs also arrive. 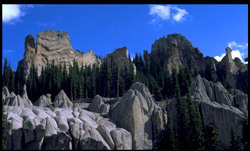 The final 1-mile access trail to the Wheeler Geological Area is foot-only and within the La Garita Wilderness Area. Most visitors here, from my experience, do the 4WD option, while others hike in. Look on a map and the access road is a sliver surrounded by the wilderness, meaning vehicles (including bikes) are permitted.